Here's some bad news: The world is facing a shortage of wine. 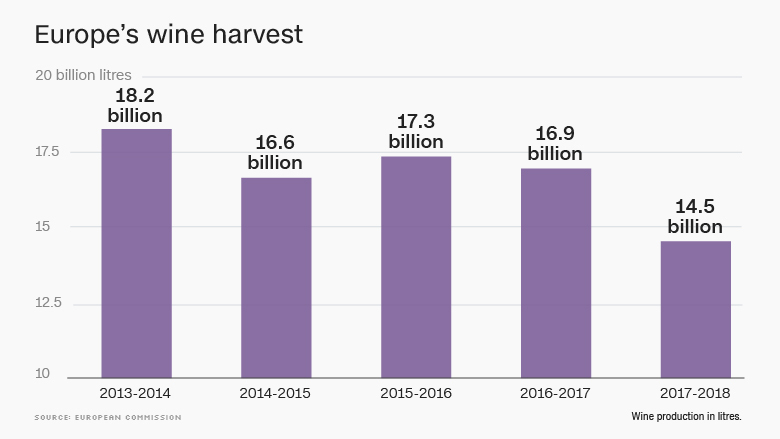 Spain, Italy and France -- which together produce over half the world's wine -- are bracing for their worst harvests in decades after extreme weather damaged grapes. The pain in Europe, combined with lackluster production in the southern hemisphere and wildfires in California's wine region, has left analysts fearing shortages and higher prices. "We still foresee a dramatic decline in wine availability going into 2018," said Stephen Rannekleiv, a global beverages strategist at Rabobank. "We expect the decline [in consumption] to be felt most tangibly in the lower-priced tiers." The European Commission says that this year's regional harvest is expected to be the worst since 1982. Europe is set to produce 14.5 billion liters of wine this year, a drop of 14% from 2016. Italy, the world's biggest producer, will see volumes fall 21% to just above 4 billion liters. Production in Spain and France will decline by roughly 15%. "It has not been uncommon for one of these three producers to have an off year, but rarely have we seen such poor harvests for all three simultaneously," Rannekleiv said. European vineyards were battered by heavy hailstorms and harsh frosts in the spring. In April, grape growers in Burgundy were forced to deploy huge fans and heaters to protect their crop. Many of the vineyards that were spared in the spring were later damaged in devastating summer droughts. The problem is most severe on the Italian island of Sicily, where production was a third lower than last year. Unusually warm weather means that many grapes ripened early and are smaller than usual. "Everyone is harvesting early this year, which usually leads to lower yield," said Richard Halstead, co-founder of Wine Intelligence, a market research firm and consultancy. Consumers are already feeling the effects, with the price of some wine varieties increasing this year by up to 10%. "The rise in Italian and Spanish bulk wine prices is particularly noticeable and it started as early as May, when the first threats to production materialized," Rannekleivn said. 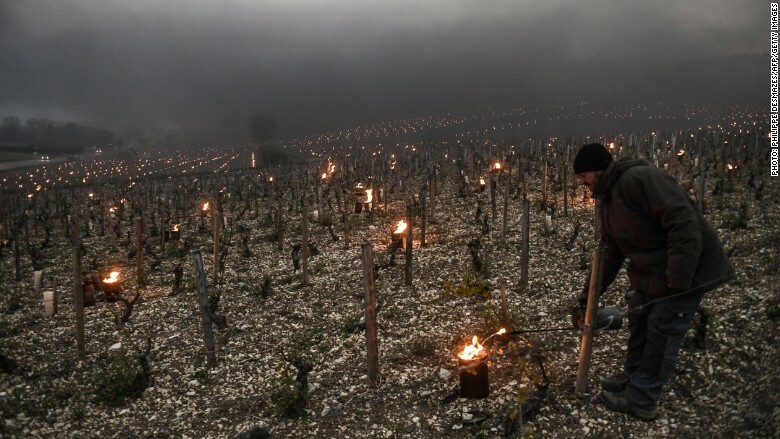 French wine growers deployed heaters to save their grapes. 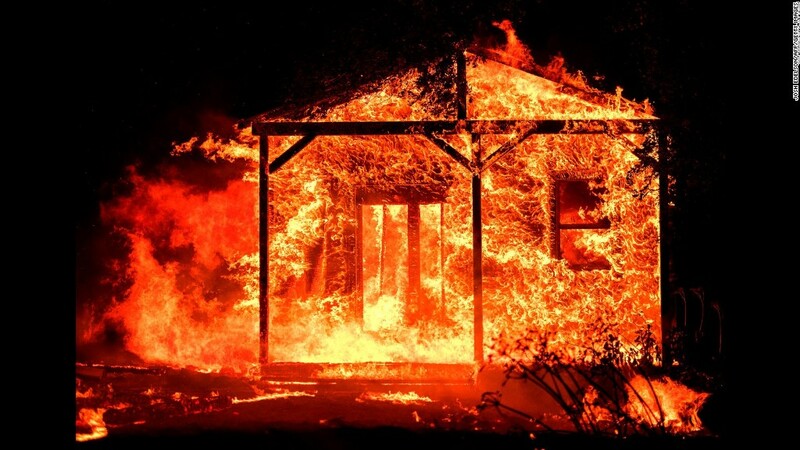 Devastating fires in California mean the U.S. -- the world's fourth largest producer -- won't be able to make up for shortages elsewhere. While the harvest is around 90% complete in both Sonoma and Napa, there is a chance that the remaining grapes could be lost or tainted by smoke. "The real danger is the potential loss of damage to the vines for future years. We are a long way from knowing what that could mean for wineries," said Michael Kaiser, vice president of WineAmerica. Global producers usually make more wine than is consumed each year. Some is released into the market in subsequent years, while the rest is distilled or used in other products. The surplus was around 2 billion liters in 2016, according to data from the International Organisation of Vine and Wine. "If Italy, France and Spain are all down, it will bite into this surplus and it is possible that we will see shortages," Halstead said.